Queen + Adam Lambert: Even the Negative Reviews are Great! You are here: Home / Tours and Live Performances / 2014 Queenbert Tour / Queen + Adam Lambert: Even the Negative Reviews are Great! With all the completely positive reviews raving about the Queen + Adam Lambert tour, it’s hard to imagine that there could be a negative one. Yet somehow I managed to come across one (scroll down) from the Houston Press Blogs when Lila and I got home from our third Queenbert concert (Dallas). After reading the headline I immediately recognized it may not be glowing about the man and tour that we all love. I took a deep breath and held it as I began to read. Thankfully I was able to resume regular breathing after getting through the first couple of paragraphs. Masked behind these supposed points of disapproval are the complete opposite. Adam’s talent is complimented again and again. If the worst this reviewer could come up with was that during one song Adam mimicked Elvis, than that’s hardly something complain about. All the people who believe the problem here is that Lambert can’t fill Mercury’s shoes have it all wrong; the problem is that Adam Lambert is too talented to vamp on stage while Brian May works his way through yet another (admittedly impressive) guitar solo. It sounds like this Glambert-in-hiding is crying for a solo Adam Lambert tour! Aren’t we all?!? We just have to patiently wait for the release of his 3rd album. Let’s see what you think. Please comment below with your thoughts about the specific points the reviewer made. A. You’re a member of a Hall of Fame-level band who wrote some of the most famous, popular songs in rock music. Your lead singer was perhaps the greatest of all time, but he’s no longer with us. You can still play and, more importantly, you still want to play, but no matter what you do, the shadow of your fallen front man will always be there. B. You’re a singer with an amazing voice, good looks, and a charming personality. You should be a megastar, but you just haven’t found the right songs yet. You have fans, but you need something to push you over the hump that separates pop act and legit star. If you look at these two situations and think, “Well, why not put A and B together?”, congratulations for picking the path of least resistance. The good news is that this solution will make both parties some serious money. That’s pretty much where the good news ends for Queen and Adam Lambert. 1. Queen has an amazing collection of songs. 2. Brian May, guitarist and occasional astrophysicist, and Roger Taylor, drummer and occasional [insert hobby here], still know how to bring it onstage. 3. Adam Lambert has an amazing voice. Just flawless. Now, admittedly, the decision to do this tour with Lambert is the one that in theory should make the most sense. And sometimes it actually makes more than sense; on songs like “Killer Queen” and “I Want It All” they actually do manage to make some magic, and it’s quite impressive. The problem is that these magic moments are few and far between. Adam Lambert is probably the best choice to front Queen if you need a warm body to fill that position; he’s miles ahead of Paul Rodgers and a much better contemporary choice than, say, Lady Gaga. The problem is that just because he’s the best choice doesn’t mean he’s a good choice. The Los Angeles Times’s review was the worst I have read. This was not really bad and most I have read are great. My husband daughter, and I had the privelage of seeing Queen with Adam in Detroit. I have been to many concerts and this one rates at the top of the list. Not only did they sound amazing, but they were having fun, laughing and goofing around. My husband and I both saw Queen with Paul Rogers, Adam blew him away with his vocals, and charisma. My husband saw Queen with Freddy a couple of times and stated that Freddy would be proud! Leaving the concert, it seems everyone we came in contact agreed that Adam is a perfect and natural fit. Its known by “ALL” that you can’t please everyone! I saw the show here in Vancouver, Canada….& it was just FANTASTIC (as I knew it would be)! The arena was sold out & the CHEERS & APPLAUSE were deafening! 2 1/2 Hrs of shire BLISS!!! The music enlightened out hearts with many wonderful memories as we ALL sang along! It showcased the talent of one of the BEST rock bands to come along to date! Adam’s talent spoke volumes as it ALWAYS DOES! I would see many more if I had the opportunity! So…although you can’t please everybody…the added shows in the various countries at the last minutes certainly speaks the TRUTH! SHARE THIS AMAZING COLLABORATION WITH US TOO!!!! It shouts!!! We ALL LOVED MERCURY…that’s who we sing along with when the songs fill the room! There is “Only ONE FREDDIE” & we will never forget…BUT….Queen does not deserve to not have the opportunity to live on! Mercury had other amazing mates that assisted his/their dream! Band = Collaboration!!! I say let the music live on…be celebrated & be introduced to the younger generation!!! No Harm in that…ONLY LOVE & ADMIRATION! Many of my friends that frequent many concerts say…its one of the best concerts they have seen! Queen picked ADAM for a very good reason! Enough said! 1. Where were you when all of the OTHER **Magic** moments were happening??? Because I saw PLENTY of those… 🙂 Seeing the legendary men of QUEEN and the also wonderful and talented Adam Lambert under one roof, performing those iconic Queen songs, is totally MAGICAL for me! As in ALL of it!!! 2. Please explain this one (again to Cory): “The problem is that just because he’s the best choice doesn’t mean he’s a good choice. “.. I agree with @Adamicted: the response of the audiences in Vancouver and Las Vegas, and in every other venue from what I’ve heard and seen, (and according to the majority of the other official (and unofficial..) reviews), filled with Queen fans, some Adam Lambert fans of course 🙂 , some of us who are fans of both (that would be me for instance)… was deafening and very clearly approving…. So all in all, pretty decent review above.. but still…um…what??? Thanks Carol for posting, and thanks Lisa for the wonderfulllllllll picture! Well said! Totally agree. The last paragraph was just bizarre. The reviewer fails to give ANY suggestion of how Queen could have got it “right”. Frankly, I don’t think there’s anyone out there who could have done as well as Adam, given the circumstances. Yep, I’ve heard all glowing reviews from everyone who has seen it or even heard about it! They’re amazing together! I just read the entire review. This person is a nut case. Cory whoever did not make much sense to me. What a weird review. Of course the person is entiled to their opinion but it just doesn’t make any sense whatsoever. I’ve been a Queen fan for many years and an Adam fan along with thousands of others here in the UK and all i can say is this collabaration between these hugely talented people is nothing short of a dream come true. I saw them at the Hammersmith Apollo and still rave about how fantastic they were. Why shouldn’t Queen continue as a group?? Many people should have the opportunity to attend a concert of theirs. And Adam most certainly isn’t there to fill Freddie Mercury’s shoes, this young man has his own fabulously glam shoes to strut about in. I don’t pay any attention to the critics to speak of. I just got home from the concert in Dallas & for me, it was extrodinary. I screamed & danced like I was a giddy teenage girl. I simply loved everything about this concert. Queen was awesome & Adam (who was about 50 feet from me) is almost surreal. Looks as if those critics were just grasping at straws to find something wrong is the way I see it. I agree with those who are saying that critics are just searching for issues….when there are none. 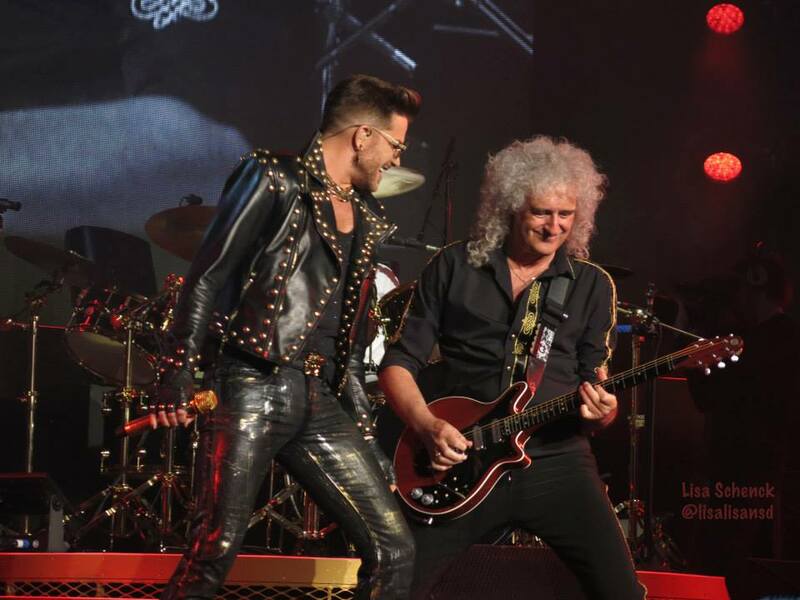 The simple fact is the negative reviews are wrote by people who honestly have issues with Adam and with Queen doing a tour….they just can’t get over the fact that both are great and this concert is awesome. I have long felt that Adam does not get respect and recognition because quite frankly…all the execs…other singers…know he can sing them under the table. They are homophobic (execs and radio station owners…bunch of old men who feel threatened by a young handsome mega talented openly gay man) and jealous. I mean seriously…how else do we explain snubbing him at award shows, radio stations not playing his songs (I requested a ton of times…and they still would not play). The songs on the radio now…with exception of a few…are garbage…teeny bopper stuff….Adam’s singles have been great. He is working on a 3rd album…and this one I believe he said is going to be different…think more rockish….which is great. I don’t bother worrying about the negative reviews because as some have said…these writers have some serious issues already. Funny…even this writer is like…his voice is amazing. Yep…we know. Hello everyone – I have two tickets for sale (face value) for the concert in Toronto on Monday, July 28 – they are excellent seats! Please contact me if you would like to attend this awesome, amazing concert! And bad reviews have made me so angry. Since I would give anything that I have in this world to see Adam and Queen, it is so upsetting to know that there are people who are able to attend and then they want to try to ruin the experience for others. It wouldn’t matter to me if they all just sat on the stage and hummed together, I would feel honored to be there.